A UH-60 Black Hawk helicopter performs a mock insertion during air assault training conducted by members of A Company, 1st Battalion, 183rd Aviation Task Force here, Aug. 19. The task force, made up of National Guard units from six states, provided air support to the 116th Cavalry Brigade Combat Team during force-on-force battle simulation training. Two UH-60 Black Hawk helicopters kicked up dust on a hilltop in the Mojave Desert as Soldiers piled out, hit the ground and established security during a practice air insertion here, Aug. 20. Air insertions were just one of the tasks the 1-183rd Aviation “Task Force Talon” executed in support of the 116th Cavalry Brigade Combat Team’s rotation, Aug. 14-25. The 1st Battalion, 183rd Attack Reconnaissance provided 12 AH-64 Apache helicopters and a company of pilots to support the rotation. 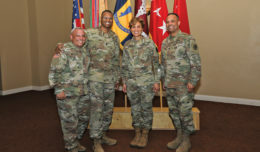 Battalion leadership oversaw command and control of the task force. 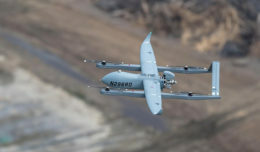 “During NTC rotation 15-09, Task Force Talon is providing the 116th CBCT full aviation operational support in terms of attack aviation, lift and medical evacuation operations,” said Maj. Chris Schoonover, of Boise, Idaho and commander of the 1-183rd Aviation Task Force. Composed of Army National Guard units from six states, the 1-183rd Aviation Task Force consisted of an attack aviation company and multiple companies of general support aviation assets. Each airframe had a unique mission, and the units’ Soldiers trained to increase their proficiency as pilots, support personnel and maintainers. Together, Task Force Talon ensured the 116th CBCT had the advantage when it came to fighting, moving Soldiers and equipment, and medical evacuation support. 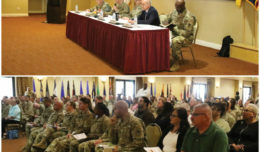 “The ability to bring together units from six different states and come together as a task force, move out to the field and execute operations, really demonstrates the level and abilities of National Guard Soldiers to work as a team,” Schoonover said. The 116th CBCT lift support consisted of Idaho’s A Company, 1st Battalion, 168th General Support Aviation and pilots from B Company, 2nd Battalion, 224th Aviation of Maryland and Virginia. Two CH-47 Chinook helicopters from B Company, 2nd Battalion, 149th Aviation from Arlington, Texas, rounded out the heavy-lift capabilities. The 116th CBCT received combat aeromedical evacuation support from C Company, 5th Battalion, 159th General Support Aviation from Montana and Wyoming. Airspace was managed by a section of air traffic controllers from F Company, 2nd Battalion, 211th General Support Aviation from Arkansas. The air traffic controllers tracked the locations and communicated with aircraft to de-conflict airspace. Soldiers from B Company, 449th Aviation Support Battalion from San Antonio, augmented the units’ organic maintenance support personnel. Soldiers of E Company, Forward Support Company, 1-183rd ARB fed, fueled and completed vehicle maintenance to keep the Soldiers and equipment in working condition. Pilots flying one of the most advanced attack helicopters in the world practiced their target acquisition skills during live-fire gunnery in support of the ground combat units. After gunnery, they transitioned to supporting the ground units during a three-day, force-on-force mission against the opposing force. 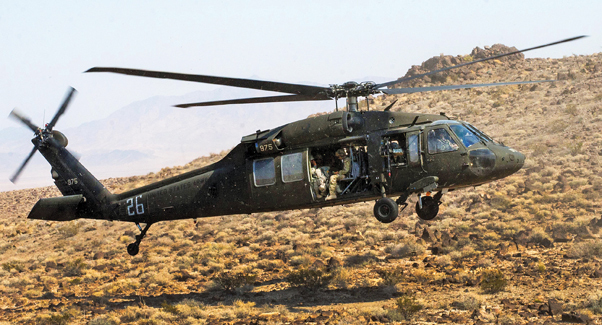 The Idaho, Maryland and Virginia Black Hawk pilots conducted dozens of missions moving dignitaries, unit leadership and equipment throughout the training area. “We have been conducting missions moving the Battalion and brigade commanders who want to see their troops to check on their condition as well as critical repair parts,” said Warrant Officer Derrek Bohman, of Boise, Idaho, a Black Hawk pilot with A Company, 1-168th GSAB. An important mission for the utility helicopters was the air insertion of Soldiers. Crew chiefs conducted training sessions with Soldiers to teach them the proper methods of entering and exiting the aircraft during air assaults. Each Black Hawks transported up to 11 Soldiers and their gear, while Chinooks carried 36 Soldiers, but it wasn’t a bus ride for the Soldiers. The pilots typically flew fast and low to the ground to avoid enemy contact. Like a shell game, the pilots executed false insertions to protect the location of the real insertion. Another vital mission of the Task Force was to provide MEDEVAC support, which could be completed by HH-60 Black Hawks staffed by a crew of medics and medical equipment. Maintenance and logistics was also critical to the success of Task Force Talon. Getting parts to the helicopter mechanics was the responsibility of E Company, 1-183 ARB, as was pumping bulk fuel into the fleet. Mechanics maintained the task force’s vehicles and the cooks fed the task force. By being focused and armed, the 1-183rd Aviation Task Force became a battlefield multiplier for the 116th CBCT. Without the team of pilots, mechanics and support personnel, the more than 20 helicopters would not have made it off the ground. Each airframe had a particular mission, but every Soldier was essential to winning the fight. Spc. Trenten Kammerman, a combat observation lasing team member provides security during air assault training conducted by members of A Company, 1st Battalion, 183rd Aviation Task Force, here, Aug. 19.